Sorry sorry yet again for the long time between blogs. No excuses, just a mad summer back in the UK for our hurricane break. Took Helen for her annual pilgrimage to see Andrea Bocelli in Tuscany and being registered disabled Helen gets to go free. Top marks, Mr Bocelli. I even managed a few hard fighting carp as I sneaked in a travel rod this year. The rest of the summer has been taken up with fighting builders as we were having a new conservatory built. Now it is finished it was worth all the grief and we should have done it years ago. Also have been battling the NHS to get a minor op done during my summer stay in UK. Can’t fault the NHS with the way they have dealt with my wife’s MS, but trying to get my minor op done has been a different matter. But as I go in today – job done. Back in the US, fantastic news about the new rod I have been developing with Snowbee for the professional kingfish guys. Snowbee now sponsor a top team which, using one of the new rods, won a major round of the championship – 50lb+ fish and $25000+! We now have replicas of this rod for sale in US and high hopes for successful sales. Back to blog title, Dolphin Madness. It always brings a smile to us to see the look of horror on first timers to Florida at local restaurants to see diners tucking in to fillets of fresh local dolphin. Fear not, it’s not slices of Flipper and his friends, but just the local name for dorado and jolly tasty it is too. 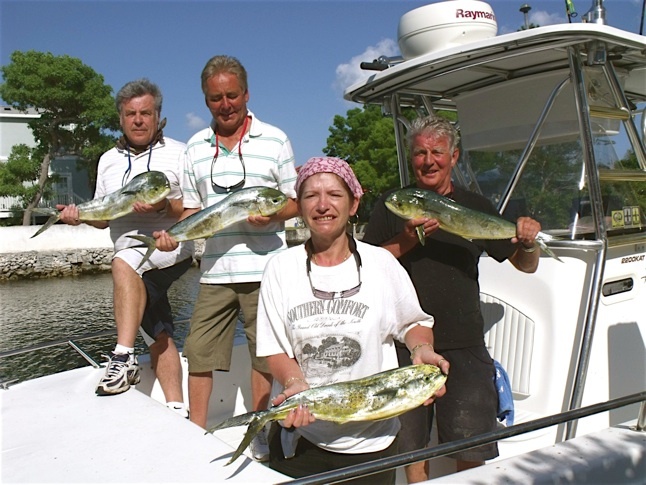 Whilst we catch dorado all year long we always look forwards to the prime migration time in summer, as this is when numbers peak on their annual migration in the tropics. The lifecycle of the dorado is truly amazing with a short life span 2 to 3 years, only they reach 40lbs in just 12 months topping out at 70+ in 2 to 3 years, and breeding in just months. 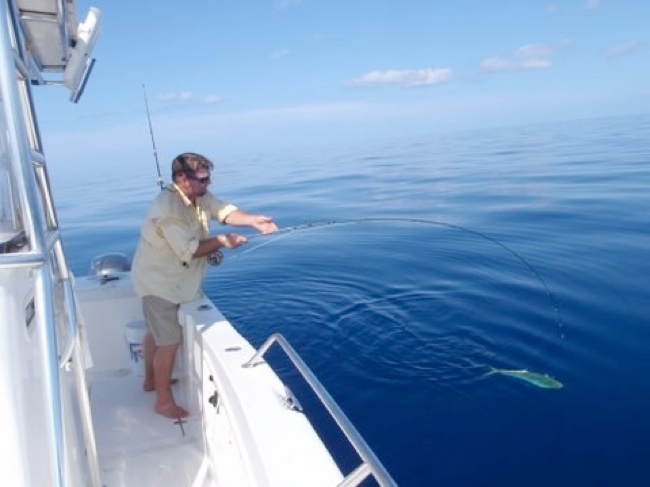 Normal fishing method is open water top trolling but fish are found on weed lines and any floating debris where all other methods can be used, such as fly, spinning, or bait live and cut. The colours of dorado are out of this world; greens, yellows, blues, etc. and have to be seen. The fight is also amazing with lots of jumps and runs giving lots of oohs and ahhs. 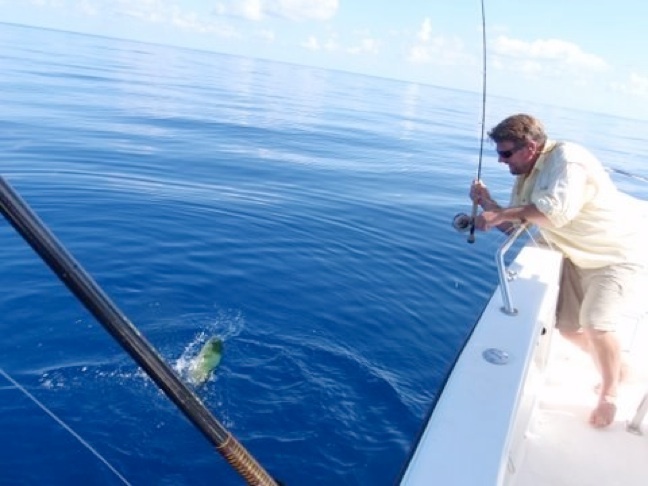 This year we had a good dorado day with Dave Harris. Dave and his wife Leslie are regulars at Fish the Dream and this year are coming out twice, and it was nice to take a local friend of Dave’s out for a day’s fishing. 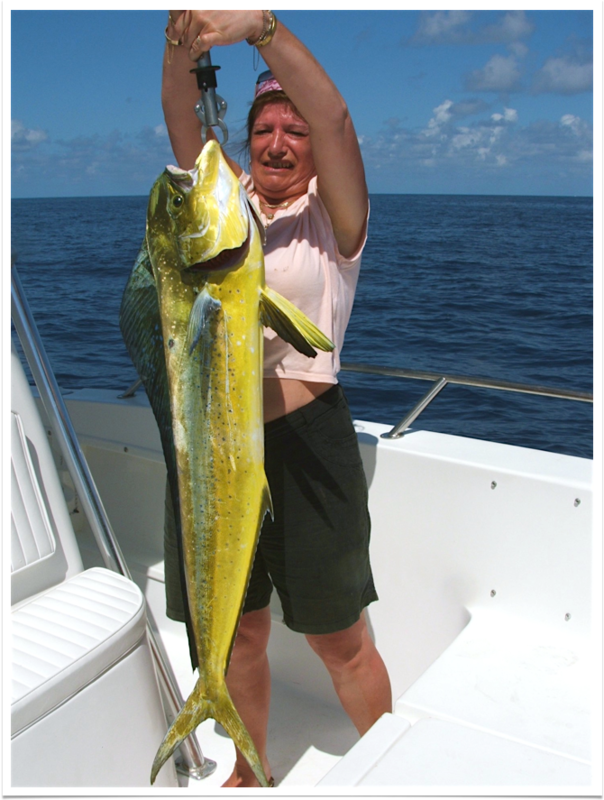 Last year Leslie had a dorado nearly as big as her but it chose the wrong rod if it wanted to get away, as not much gets past Leslie. Well done. 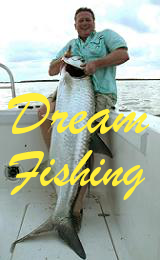 Lastly must say a huge thanks again to John Aplin for running Fish the Dream this summer. Praise from all his guests, told you so mate, the only down side being that he is now a marine mechanic, and very good at house work. Sorry. 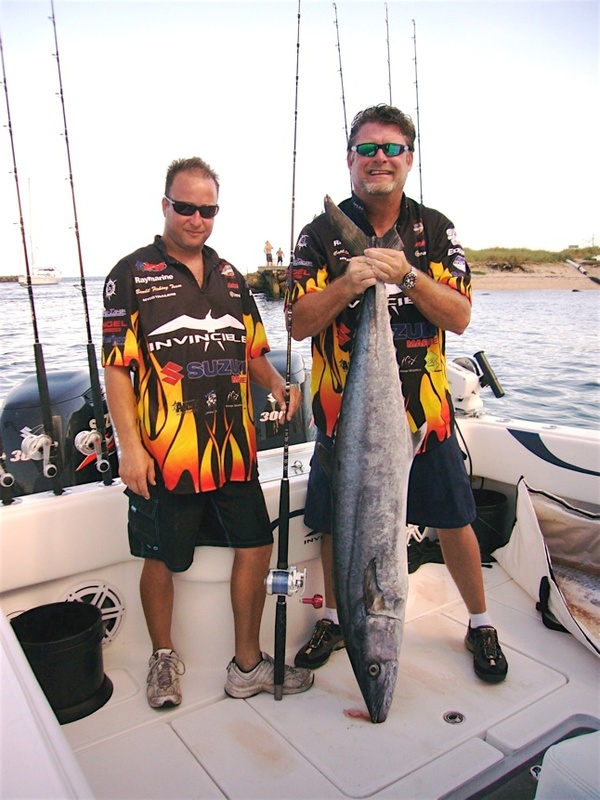 Pics: winning kingmac, Dave’s dorado day, skipper John dorado on fly.